At UN, Outgoing Khalilzad Quieter on Congo and Reform, the Price of Being Well-Liked? UNITED NATIONS, January 12 -- With Barack Obama set to take control in eight days, it's the time it seems for revisionist assessments of Zalmay Khalilzad, the outgoing Bush administration's U.S. Ambassador to the UN. Khalilzad is certainly better liked within the UN than his predecessor John Bolton. Liberal and moderates even sense that he is one of them. Some of this is due, however, to disinterest. Khalilzad's interests were Afghanistan and Iraq, to some degree the Middle East -- Africa much less so, and UN reform surprisingly little. Maybe accomplishments on the first two issues had to be bought by backing off on reform. Khalilzad rarely mentions the UN's largest peacekeeping mission, and the largest global war since the one resulting in the UN: the Democratic Republic of the Congo. One assumes that this prioritization will change under Obama and the Ambassador he has nominated, Susan Rice. In perhaps another sign of disinterest or priorities being elsewhere, there is Somalia, a peacekeeping for which Condoleezza Rice had projected before the end of 2008. While a resolution is slated to be adopted before January 20, as Inner City Press exclusively reported at New Years, it will be a largely UK-drafted proposal, different than which Condi Rice had said. Under Khalilzad unlike Bolton, the US Mission became unwilling to comment other than "on background" about UN reform. There are claims of accomplishing a UN-wide Ethics Program and Whistleblower Protection, as well as public access to information and financial disclosure, at UN Fund and Program like the UN Development Program, but Secretary-General Ban Ki-moon accepted outgoing UNDP Administrator Kemal Dervis' assertion that the UN Ethics Office had no jurisdiction over UNDP or its firing of a whistleblowing employee. While UNDP's Administrator answers to his own Executive Board, now Ban -- and the U.S., to be realistic -- will be naming Dervis' replacement. Why not make accepting the jurisdiction of the UN Ethics Office a condition for being selected? In one comment that Team Khalilzad allowed to be "on the record," Inner City Press asked Khalilzad if American Lynn Pascoe will be staying as the head of the UN Department of Political Affairs. 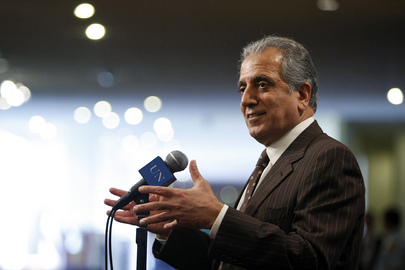 Khalilzad said he has no reason to believe that he will not. A senior UN official, asked Monday afternoon by Inner City Press about Khalilzad's general non-mention of the Congo, noted that his wife Cheryl Benard is very interested in the Congo, particularly the issue of sexual violence there. So perhaps there is a divison of labor in the family. They are nice people. Certainly they had their achievements. Why not then be on the record? What approach will Obama, Hillary Clinton and Susan Rice take? Watch this site.